Packed with a powerhouse of healthy, antioxidant rich organic vegetables, super rich immunity mushrooms, flax seed, amino acids, fiber, phytonutrients, vitamin C and super fruits from around the world. 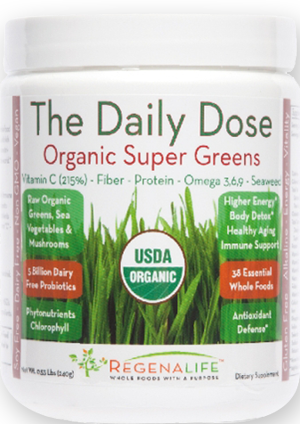 The Daily Dose may enhance the alkalinity of your body. In general, disease thrives on an acidic pH environment. 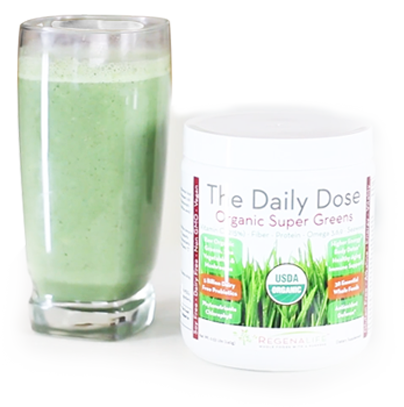 The Daily Dose Super Greens may help make your body pH become more alkaline. Provides nutrient-rich organic vitamins and minerals to the cells in your body which will give you more energy than you've ever had before. SATURATES your body with many powerful sea vegetables that are not present in other vitamins and nutritional products. Strengthens your body's immune system by providing a powerful combination of clinically tested medicinal mushrooms. High in Vitamin C (215%), a critical antioxidant that protects and defends your body from free radical damage. BOOSTS the immune system and also boosts immune function. REGENERATES your body's cells by providing 38 Essential, POWERFUL and nutrient-rich ingredients. Combines SUPER-NUTRITION with SUPER BIO-AVAILABILITY that absorbs into your body in seconds. 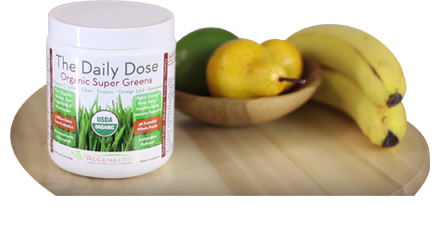 Adding nutrition from green superfoods can help with weight loss, because the greens nutrients will help to curb your appetite..
"It's easy to go green. Shop Natural and Organic Products Today and Feel the Difference." 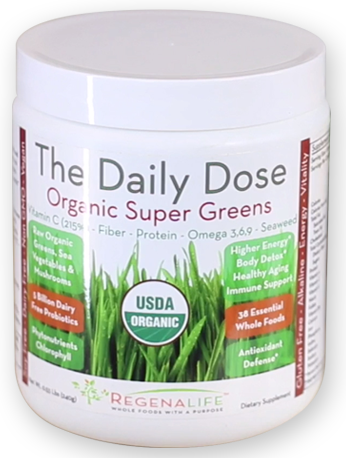 And...The Daily Dose Super Greens is USDA Certified Organic!